F Thomas Raffl (Kelowna, Swift Current, 2005-06) has signed a one-year extension with Red Bull Salzburg (Austria, Erste Bank Liga). This season, he had 26 goals and 24 assists in 43 games. . . .
D Mike Card (Kelowna, 2002-06) has signed a one-year extension with Löwen Frankfurt (Germany, DEL2). In 52 games this season, he had five goals and 22 assists. . . .
F Clarke Breitkreuz (Regina, Prince George, 2008-10) has signed a one-year extension with Löwen Frankfurt (Germany, DEL2). This season, in 52 games, he had 16 goals and 12 assists. . . .
F Brent Raedeke (Edmonton, Brandon, 2007-10) has signed a three-year extension with Adler Mannheim (Germany, DEL). He had 16 goals and 17 assists in 52 games this season. . . .
F Joel Broda (Tri-City, Moose Jaw, Calgary, 2004-10) has signed a one-year extension with Linz (Austria, Erste Bank Liga). This season, in 53 games, he had 28 goals and 20 assists. . . .
F Ondrej Vesely (Portland, Tri-City, 1996-98) has signed a one-year extension with Zlin (Czech Republic, Extraliga). He had four goals and nine assists in 45 games this season, while serving as an alternate captain. . . .
F Kevin Sundher (Chilliwack/Victoria, Brandon, 2007-12) has signed a one-year extension with Olomouc (Czech Republic, Extraliga). He had one goal and one assist in 10 games there this season. He started the season with the Reading Royals (ECHL), putting up five goals and 12 assists in 32 games. He signed with Olomouc on Feb. 2. . . .
F Thomas Raffl (Kelowna, Swift Current, 2005-06) has signed a one-year extension with Red Bull Salzburg (Austria, Erste Bank Liga). This season, in 53 games, he had 26 goals and 24 assists. . . .
D Layne Viveiros (Portland, 2011-15) has signed a one-year extension with Red Bull Salzburg (Austria, Erste Bank Liga). He had nine goals and 13 assists in 54 games this season. The OHL came down on the Windsor Spitfires for comments and actions following their Sunday loss to the host London Knights. You may have read or seen clips of Rocky Thompson, Windsor’s head coach, ripping into the referees and also accusing the Knights of diving. “It is the position of the league that the post-game media comments made by . . . Rocky Thompson were most inappropriate and detrimental to the welfare of the league. As a result of his comments, and the Spitfires’ Twitter post including such comments which is not consistent with the league’s social media policy, the Windsor Spitfires Hockey Club is fined $7,500. Last night, the host Spitfires posted a 3-1 victory over the Knights to take a 2-1 lead in the best-of-seven first-round series. Game 4 is scheduled for Thursday in Windsor, with Game 5 in London on Friday. Broncos. . . . Foster celebrated his 21st birthday by scoring his second and third goals of the series. . . . The Warriors now hold a 2-1 lead, with Game 4 in Swift Current tonight. . . . D Colby Sissons gave the home team a 1-0 lead at 6:49 of the first period. . . . The Warriors took a 2-1 lead on second-period goals by F Brayden Burke (2), at 2:16, and Foster, at 11:18. . . . The Broncos pulled even when F Glenn Gawdin (2) scored at 8:15. . . . F Jayden Halbgewachs (1) got the Warriors back into the lead at 15:34 of the third period, and Foster upped the lead to 4-2 at 18:34. . . . The Warriors got back to within a goal when F Ryley Lindgren scored, on a PP, at 19:31. . . . D Josh Brook and D Matt Sozanski each had two assists for Moose Jaw. . . . F Aleksi Heponiemi had two assists for the Broncos, with Gawdin adding one to his goal. . . . Moose Jaw G Zach Sawchenko stopped 32 shots, six fewer than Swift Current’s Jordan Papirny. . . . The Broncos were 1-3 on the PP; the Warriors were 0-2. . . . Announced attendance: 2,890. Perry's snow report: Dauphin edition. Kings, 6-2. . . . The Tigers lead the series, 3-0, and get their first opportunity to eliminate the WHL’s defending champions tonight in Dauphin’s Credit Union Place. . . . The Wheat Kings had to take their first-round games on the road because the Royal Manitoba Winter Fair has taken over the Keystone Centre complex. . . . The Tigers got the only goal of the first period when F Steve Owre scored at 7:13. . . . Brandon F Ben McCartney, a 15-year-old from Macdonald, Man., tied it with his first WHL goal at 3:41 of the second period. He was a second-round selection in the 2016 bantam draft. . . . Medicine Hat got that one back at 5:42, with F John Dahlstrom scoring his third goal in as many games. . . . Brandon F Reid Duke (2) pulled his guys even, on a PP, at 6:50. . . . 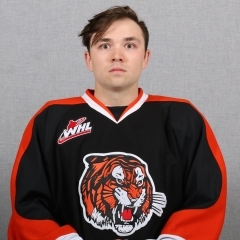 The Tigers went back out front at 4:12 of the third period, with F Mark Rassell getting his fourth goal of the series, on a PP. . . . F Chad Butcher added insurance at 5:49, and F Ryan Jevne and D David Quenneville, into an empty net, closed it out. . . . Quenneville also drew three assists, with Owre and Butcher earning one each. . . . G Michael Bullion stopped 27 shots in his third straight playoff complete game for the Tigers. . . . Brandon got 41 saves from G Logan Thompson. . . . Brandon was 1-3 on the PP; Medicine Hat was 1-6. . . . The Wheat Kings were without injured F Nolan Patrick for a third straight game. . . . Medicine Hat scratched injured D Brad Forrest. . . . Announced attendance: 1,912. The arena has 1,763 seats. 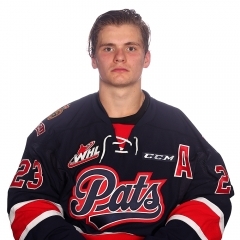 Regina Pats to a 5-2 victory. . . . Regina, with a 15-5 edge in goals, leads the series, 3-0, and can end it Thursday night in Calgary. . . . Steel has nine points, four of them goals, in the first three games of this series. He had a goal and four assists in Regina’s 5-1 home-ice victory in Game 2 on Saturday. . . . Steel now leads the playoff scoring race with nine points, one more than D David Quenneville of the Medicine Hat Tigers. . . . Steel gave Regina a 2-0 with first-period goals at 1:02 and 9:31. . . . F Wyatt Sloboshan increased the lead to 3-0, on a PP, at 19:57. . . . F Dawson Leedahl scored his third goal of the series, on a PP, at 16:59 of the second period. . . . Steel completed his hat trick with a shorthanded goal, at 4:16 of the third period. . . . The Hitmen got third-period goals from F Matteo Gennaro (1), on a PP, and F Luke Coleman (1). . . . The Pats got two assists from D Connor Hobbs, with Leedahl adding one to his goal. . . . Regina G Tyler Brown had a solid night, with 41 saves and an assist on what turned out to be the winning goal. . . . The Hitmen got 30 saves from G Kyle Dumba. . . . Calgary held a 16-11 edge in second-period shots, and it was 17-10 in the third. . . . Regina was 2-3 on the PP; Calgary was 1-6. . . . The Pats had F Jeff de Wit back after a one-game absence with an undisclosed injury. . . . Announced attendance: 6,736.
skated to a 4-1 victory over the Kelowna Rockets. . . . Kelowna holds a 2-1 edge in the series, with Game 4 in Kamloops tonight. . . . 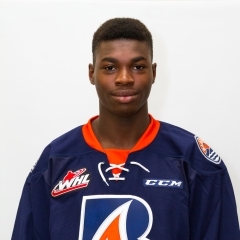 There were five WHL playoff games on Tuesday night and Kamloops was the only home team to post a victory. . . . F Lane Bauer opened the scoring for Kamloops at 8:06 of the first period. . . . The Rockets tied it when F Kole Lind scored his first WHL playoff goal at 16:28. He was playing in his 26th career post-season game. . . . The Blazers took advantage of a shoddy Kelowna change to take a 2-1 lead at 12:10, the goal coming from F Jermaine Loewen as he finished off a 3-on-2 break. Loewen, a fan favourite in Kamloops, was the most effective player in this one as he wreaked havoc with his physical play and constantly got under the skin of the visitors. . . . Just 28 seconds later, Blazers F Rudolfs Balcers split the defensive pairing of Cal Foote and Gordie Ballhorn, who put on a hook that resulted in a penalty shot. Balcers beat G Michael Herringer to the glove side for a 3-1 lead. It was Balcers’ first playoff goal. . . . Bauer’s second goal, at 18:07, provided a 4-1 edge. . . . Balcers also added an assist to his goal. . . . The last time Kamloops had a penalty shot goal in a playoff game was on April 14, 2012, when F Tim Bozon scored in a 7-2 victory over the host Portland Winterhawks. . . . G Connor Ingram stopped 37 shots in a solid night for Kamloops. . . . Herringer was good, too, with 34 saves. . . . Kelowna was 0-2 on the PP; Kamloops was 0-5. . . . Things got heated late in the third period, with the two coaching staffs exchanging words. . . . Kamloops F Luc Smith was injured in the second-last game of the regular season and has yet to play in this series. . . . Announced attendance: 3,878. . . . Prior to the game, Richard Doerksen, the WHL’s vice-president, hockey, presented WHL Milestone Awards to Blazers trainer Colin (Toledo) Robinson and Kamloops head coach Don Hay. Robinson worked his 1,500th game as a WHL trainer earlier this season, while Hay recorded his 700th victory as a WHL head coach. 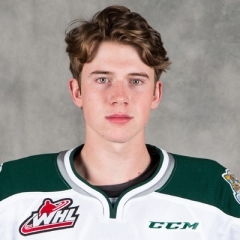 At Victoria, G Carter Hart stopped 25 shots to help the Everett Silvertips to a 2-0 victory over the Royals. .
. . Everett took a 2-1 lead in the series with Game 4 scheduled for tonight in Victoria. . . . Hart has two career shutouts, one this season and one a year ago. . . . The Silvertips scored both their goals via the PP. . . . F Patrick Bajkov counted his third goal of the series 22 seconds into the second period. . . . F Eetu Tuulola (1) added the insurance goal at 17:37 of the second. . . . F Dominic Zwerger drew two assists. . . . The Royals got 19 stops from G Griffen Outhouse. . . . Everett was 2-6 on the PP; Victoria was 0-3. . . . The Royals scratched F Jack Walker, who had two goals and two assists through the first two games. 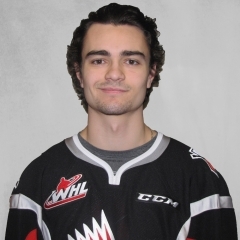 They remain without D Scott Walford. . . . Everett continues to be without F Riley Sutter and F Devon Skoleski, both with undisclosed injuries. . . . Announced attendance: 4,790.